Our second week with the boys has been lovely. It’s nice to have them settle in and we can start to see the little things that let us know they are getting used to being a part of our family. They look for us when they hear our voice and they can be settled and comforted by being close to us. It’s amazing how much changes in such a short space of time; they already look so different to me! It seems that time is moving even faster with these two, there are things we are having to do much sooner than we did with Lucas. They won’t be able to stay in our room for much longer because we can’t fit the big cot in there, our bedroom is tiny and we have already removed furniture to fit the crib in. 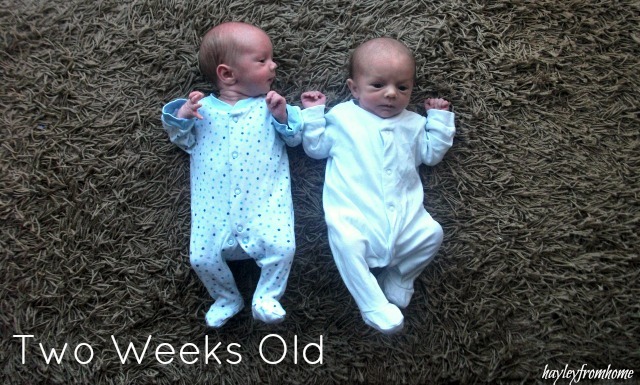 They are outgrowing the crib so quickly…we have very long babies. Lucas went into his own room at about 10 weeks and started to sleep much better but it still seems so soon to move them, however I know they will be much more comfortable with a bit more space. We are also starting the bedtime routine much earlier than we did with Lucas; it’s a lot of work so early on when I just want to cuddle them all evening but I know that when my husband goes back to work there are nights when I will have to get them to bed on my own; I need to be organised, that’s just the way I am! They are still eating well and have both come back up past their birth weight. They both look it as well, it’s crazy how quickly they grow at this stage. We are both pretty confident in telling the difference between them now. There are a couple of tell tale signs and even now we can spot a difference in their personalities. In some ways I can’t wait to see how they grow and what kind of little boys they will be but at the same time these will probably be my last babies and I want to enjoy these early days and all those lovely new born cuddles.